We use bourbon at our house. My mom always used white rum. 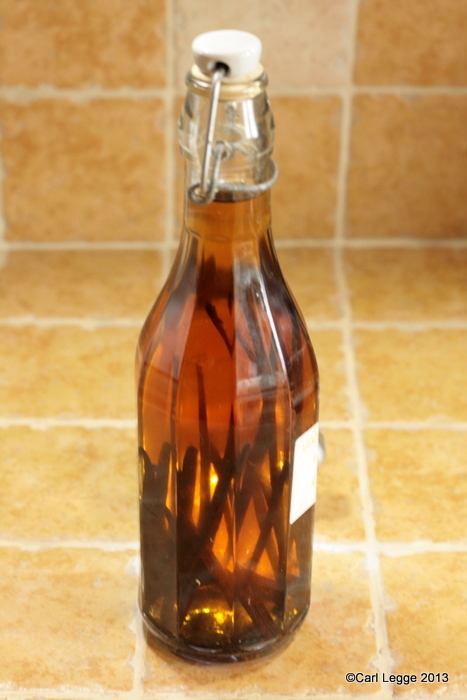 We make our own vanilla extract too, using this method. Some of our bottles are now several years old, and they’ve matured to a deep, dark brew. I’ve also made it with bulk brandy, but with less success (vodka is the only alcohol that I can’t buy cheaply at the restaurant supplier, for some reason). That’s really great information, I’ll look forward to see how mine develops. It’s only a couple of years old. Please let me know what the Vermouth is like! I made it from a CWE kit about 38 years ago (!) – it was great but they don’t make it now, and I haven’t been able to find the “secret herbs” anywhere. I was hoping to use a rhubarb wine as a base as it has a mild flavour of its own.